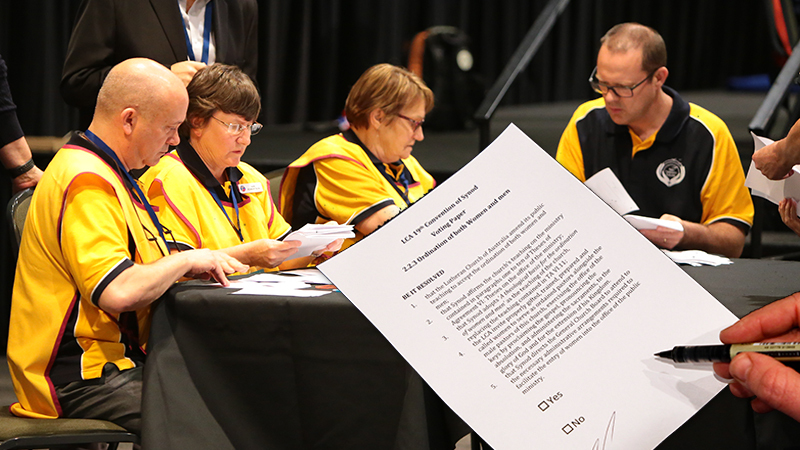 General Synod has again said ‘no’ to the ordination of women in the Lutheran Church of Australia (LCA). This evening, Friday 5 October, LCA Bishop John Henderson declared the result of the secret ballot. Of the delegates registered at Convention, 161 voted against the resolution to ordain both men and women; 240 supported it. The Constitution of the LCA requires a two-thirds majority of registered delegates to bring about a change in matters of a theological or confessional nature. The vote followed a number of sessions of presentations and debate among the delegates, supported by prayer. More than 50 delegates spoke to the proposal. General Synod has voted on the ordination of women three times before (2000, 2006 and 2015). Each time the proposal to ordain women was lost.